A trip to a place for Tutubi won't be complete without him sampling what the locals are proud of like delicacies, food for his own consumption as well as pasalubong, a part of Filipino custom to take home something for his friends, family and office mates. This time, Tutubi "met" Leyte's delicacies with the binagol of Dagami , chocolate moron (how he loves the name) and pastillas of Carigara town. the chocolate moron, similar to suman but with chocolate flavor. How to make binagol? If you're looking for binagol recipe, look for those people who has been making them for generations in Dagami town. 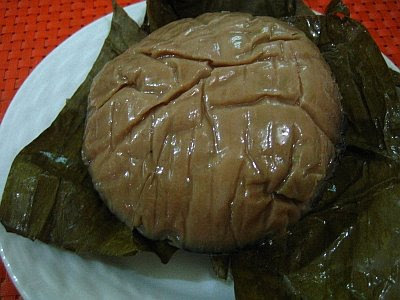 Binagol is sweetened taro (locals call the gabi species as talyan endemic in Palapag, Northern Samar) pudding with nuts Leyte. The talyan is first grounded then mixed with eggs, gata ng niyog (coconut milk), sugar, butter, nuts and chocolate. 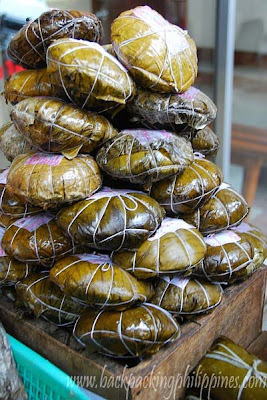 The mixture is placed in receptacles of coconut shells, called bagol (hence the name binagol), wrapped in banana leaves then steamed. Where to buy them? Tacloban market or from the towns who make them: Dagami for binagol, Carigara for pastillas, hubhob, and moron. No information yet on where to buy binagol in Manila. Tutubi has yet to see them in malls, even at weekend markets. wow, they look yummy! siguro meron nyan sa tiendesitas o sa newly reopened wow philippines. Can't be more delicate than this - my mouth is watering as it is very exotic to a Norwegian of course. I'm salivating. What is a Binagol actually? It sounds like a pastry yet not one, di ba? I used to live in the dorm that was run by a couple from Tacloban and they bring these to Manila and we got to sample them too. They are very good. 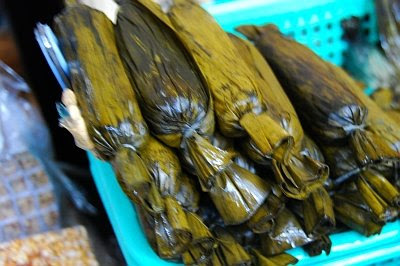 I think i saw binagol being sold in the food stalls in market! market!. these are those stalls located at the side of the outdoor eatery where they sell native delicacies. though am not so sure. it is shaped like that and piled on the cart. i've never tried binagol... it looks cool! the chocolate moron sounds tempting. salamat sa pag-share. It's nice to see that my mom's hometown's delicacy is slowly making its way to being known by fellow Filipinos and foreigners alike. Of course, can't say no to Pastillas. Binagol is not a pastry at all... it's like a pudding. But you can remove the shell and use tinfoil instead. hi! i just want to inform you that i want to use your photos in my blog for our ischools project. I will be crediting you in return. As a respect, your blog will be featured in my blog place too. Hoping for your kind heart. Thank you and God Speed. moron is pronounce with faster "mo" with stress on the "ron"
It is really very yummy and filling too, especially when premium/fresh ingredients are used in making it. There is a special moron with bits of peanuts. I'm from Tacloban City and it is true. What you see and read here ay totoo. Masarap talaga siya.Worth it. Dagami is a famous town of binagol. I always go there just to buy. Ngayon na nandito na ako sa Manila, nagpapabili parin ako ng binagol. If you want to order,you can contact me.Shipment is thru LBC. This is my number.748-0688. Please look for Alex. As far as I knew, the best moron is frm Abuyog Leyte.